In 1948, as Israel was heading into its first war, an IDF general sent a letter to David Ben-Gurion, Israel’s new prime minister, politely declining his offer to become chief of staff because he had learned the Jewish State only had six million bullets. “We will need 1 million bullets a day in a war and I am not willing to be chief of staff for just six days,” he wrote. The Weapon Wizards, an engaging look at Israel’s weapons industry, is replete with such anecdotes. (Another that’s hard to resist is how Jewish forces in Jerusalem held off Arab rioters with one gun and 11 bullets. Afterward, the commander criticized the “gratuitous use of ammo.”) Such stories drive home how little Israel had militarily in its early years. Israel’s humble beginnings make it even more remarkable that it has become a military power. The goal of the authors, Israeli journalists Yaakov Katz and Amir Bohbot, is to explain how that transformation came about. As they write, 60 years ago Israel’s biggest exports were oranges and false teeth. Today, weapons make up 10 percent of Israel’s exports. Like Start-Up Nation by Dan Senor and Saul Singer, Katz and Bohbot identify national characteristics that have led to a “culture of innovation.” Leading the list is a creativity born of necessity. “With barely any resources beyond the human capital that had immigrated to the new state, Israelis had to make the most of the little they had,” the authors write. Israel has even created a subunit of autistic soldiers to analyze satellite pictures. In the 1960s, technology futurist Marshall McLuhan rose to fame with a seemingly simple catchphrase: "The medium is the message." With the integration of television, computers and databases, he argued, communication technologies have taken on a meaning of their own that extends beyond the mere content of the information they deliver to customers. The ability of these technologies to instantaneously connect people across the globe, tearing down the physical barriers of time and place, likewise inspired McLuhan to dub the digital world a "global village." But in many ways, what modern media users experience online today is a far cry from living in a global village. Children can't safely roam the internet without supervision; adults can't surf the web without risking their identifying details, or being inundated with messages, ads and news items optimized for companies' commercial gain; users can't participate in trendy forums without expecting to get in an online shouting match. Many have responded to these dangers and inconveniences by restricting their activities to likeminded circles on the web or, in some cases, withdrawing from the digital world altogether. So where did it all go wrong? All eyes are focused on the Korean Peninsula. Signs suggest that North Korea is preparing to conduct another nuclear weapons test, perhaps as soon as April 15, to commemorate the 105th anniversary of the birth of the country's founder, Kim Il Sung. If Pyongyang follows through, the act will be nothing short of a provocation. As tensions mount, China has stressed the importance of diplomacy and of preventing the situation from escalating to an "irreversible and unmanageable stage." So far, U.S. President Donald Trump's administration has relied largely on non-kinetic means such as additional sanctions and increased enforcement or enhanced regional missile defense to keep North Korea's nuclear ambitions in check. But Washington has made clear that it will keep all of its options open. As the United States demonstrated with its limited cruise missile strike in Syria on April 6, it is willing to take unilateral military action. And considering North Korea's dogged efforts to advance its nuclear program, the Trump administration will have to carefully calculate the risks of a potential military strike. Action against North Korea could take many shapes or forms, from a limited strike to a large-scale military offensive targeting all of North Korea's military assets. On the lowest end of the scale, the United States could launch a strike to punish North Korea for continuing to develop its nuclear and missile arsenal and to deter it from pursuing nuclear weapons in the future. A punitive strike may be limited to a single base or facility in the country, with the threat of further action down the line if Pyongyang doesn't alter its behavior. Though this kind of attack offers the best way to keep the situation from escalating, it would by no means ensure that North Korea heeds the United States' warning and eases up on its nuclear and missile development. Nor does it eliminate the risk that Pyongyang may respond to the strike in kind. ** Journey's End: Warsaw and Budapest A shift is emerging in Eastern Europe. As I have mentioned previously, I spent the past couple of weeks in Europe. I completed my trip last week with a visit to Warsaw and Budapest. Both places are concerned with economic issues, resistance to the European Union’s claims on their sovereignty and, most importantly, their long-term national security. What was interesting in my meetings was the subtle shift in how Warsaw and Budapest now view their main threats. For the Poles, the Russians have long been the major issue. They see the potential for a Russian move against the Baltic states and are deeply concerned about NATO’s military weakness. In their view, should the Russians decide to move decisively, only the Americans would be in a position to bring significant force to bear, and that force would take months to arrive. It is not that they are expecting an attack. But if an attack happens, it will most likely take place in the Baltics, and the Poles will bear the major burden of resistance. The Poles have made substantial efforts in building a military, but they will be unable to hold back the Russians alone. Given the Europeans’ weakness and United States’ distance from the region, they feel isolated. In March 2017, India activated the association status with the International Energy Agency (IEA), an organization comprising 29 member countries and 6 association countries. Membership in the IEA, which is restricted to advanced economy members of the Organization for Economic Co-operation and Development (OECD), requires them to demonstrate their net oil importer status, have reserves equivalent to 90 days’ average of crude oil and/or oil products imports in the prior years, and have a demand restraint program for reducing national oil consumption by up to 10 percent. In an effort to reflect the rising role of non-OECD economies with major impact on the global energy market, the IEA introduced the “association” status in 2015. Since its inception, China, Indonesia, Thailand, Singapore, Morocco, and now India have become associated with the IEA. The association status allows these countries to participate in meetings of IEA standing groups, committees, and working parties, without prior invitation. Association countries can work with the IEA on matters of energy security, energy data and statistics, energy policy analysis, and benefit from priority access to IEA training and capacity-building activities. With India’s inclusion, the IEA accounts for about 70 percent of the world’s energy consumption. President Pranab Mukherjee inaugurated the 12th CII-EXIM Bank Conclave on India Africa Project Partnership on March 9, 2017. His address on the occasion sets the tone of India-Africa ties during the past and present times. He said: "Mindful of our common history and shared future, we have decided to elevate our relationship. For the first time ever, we welcomed representatives of all 54 countries of Africa at the third India-Africa Forum Summit in October 2015. We have since then broadened our diplomatic footprint. Our leadership has visited almost every African country in the last 18 months." He further stated that he personally went to Cote d'Ivoire, Ghana and Namibia last year. His special emphasis on the recent spurt of interest in Africa by India's leadership showcases a new Indian approach towards the African continent. This interest has generated another debate as to whether India is competing with China in Africa and trying to counter the Chinese footprint in Africa. The Chinese presence in Africa is huge and its trade with Africa was at $300 billion in 2015 while India-Africa trade stood at only $75 billion. To counter this kind of clout demands huge investments and other measures. The question, however, remains: Why should India counter China in Africa? Do their interests clash in Africa or both have their divergent interests in Africa? Both countries look at securing their energy interests in the continent along with the huge African markets for their products. India has already ignored this continent for a long time while China consolidated its position by giving huge credit lines and loans for infrastructure development to African leaders. Pakistan and North Korea are both on the verge of significantly increasing their stocks of nuclear weapons and weapons-usable materials, necessitating a recalibration of deterrent strategies. Nevertheless, effective strategies of deterrence on the state level remain the prerequisite for countering the non-state threat of nuclear terrorism. Mullah Fazlullah, the emir of the Movement of the Taliban in Pakistan (TTP), said that his group’s ultimate goal is “to implement the law of Allah on the Earth” and called on Muslims to unite and wage jihad to achieve that end. Fazlullah, one of the most extreme commanders in a group filled with extremists, also said that attempts made by Pakistan’s military intelligence service to break up the TTP have largely failed and his group has reorganized following a tumultuous period. Fazlullah made the statements in a video released yesterday by Umar Media, the propaganda arm of the TTP. Umar Media also provided an English language transcript of Fazlullah’s speech. He outlined the group’s primary goal in his opening statement. “The aim of Tehreek e Taliban Pakistan [TTP] is to implement the law of Allah on the Earth of Allah. And this will be the result of our Jihad. For Islamic ideology we have to accord sacrifices. By the grace of Allah, those who believe that implementation and uprising of Shar’iah [Islamic law] is their actual goal and absolute ambition, know that the implementation of this Shar’iah is impossible without practicing Jihad and Jihad is impossible without unity,” Fazlullah said. Throughout the speech, Fazlullah quoted the Koran to provide religious justification for the TTP’s war against the Pakistani military and government, and said that it is the obligation of clerics to rally Muslims to the cause. China's new Cybersecurity Law will go into effect on June 1, 2017. According to official statements, the purpose of the law is to protect China's national security and social stability through close supervision of internet content and technologies. The law has the potential to affect every Chinese or foreign internet or information technology business operating in China. After the law was announced, there were concerns in the West that the continued operation of foreign companies in China will be conditional upon their providing information and technologies to Chinese authorities, or on the inclusion of "backdoors" in their products. Another concern is that foreign companies will be forced to make way for local governmental companies that develop products that are adapted to the regulations of the Chinese market. Similarly, every Israeli technology company that is involved in social media or information will be supervised by the Chinese authorities and will be forced to operate under many more restrictions than before. China's new Cybersecurity Law will go into effect on June 1, 2017. According to official statements, the purpose of the law is to protect China's national security and social stability through close supervision of internet content and technologies. The law has the potential to affect every Chinese or foreign internet or information technology business operating in China. After the law was announced, there were concerns in the West that the continued operation of foreign companies in China will be conditional upon their providing information and technologies to Chinese authorities, or on the inclusion of "backdoors" in their products. Another concern is that foreign companies will be forced to make way for local governmental companies that develop products that are adapted to the regulations of the Chinese market. 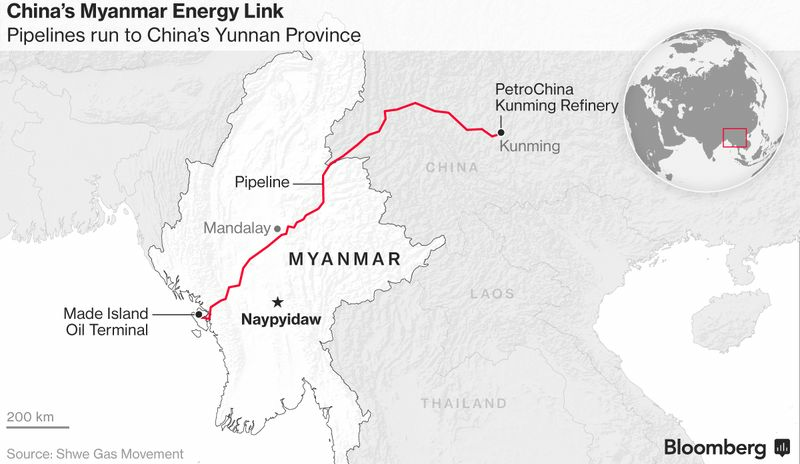 A crude pipeline to southwestern China through its neighbor Myanmar began operations after years of delays, allowing the world’s second-biggest oil user to receive supplies faster from the Middle East and Africa. A Suezmax-sized tanker, which can hold 140,000 metric tons (about 1 million barrels) of crude, began offloading oil for the pipeline on Monday at Myanmar’s Made Island, according to China’s official Xinhua News Agency. Operations on the line, which was completed in 2014 and originally scheduled to start the same year, are beginning after the government of Myanmar agreed to lower transit fees, Wang Dongjin, president of PetroChina Co., said last month. The link, which allows China to import crude from the Middle East and Africa without having to ship through the Straits of Malacca and into the South China Sea, is part of President Xi Jinping’s "One Belt, One Road" infrastructure and trade development plan stretching across Asia to Africa and Europe. The 11 short articles in this text examine 1) the competing interests between Azerbaijan, Iran, Turkey and other actors in the South Caucasus region; 2) the exercising of soft power by the Güllen Movement, Turkey and Russia in the area; and 3) the state-building struggles of Armenia, Georgia and Azerbaijan following the collapse of the Soviet Union. The Russian-made Pantsir short to medium range surface-to-air missile and anti-aircraft artillery weapon system is “the most efficient means” of countering the US-built Tomahawk Land Attack Missile, one of the leading Russian experts engaged in developing electronic warfare measures told the newspaper Izvestiya. The expert, who spoke to the newspaper on condition of anonymity, warned that the Tomahawk is a “very complex target,” adding that not a single nation in the world has 100-percent efficient defense system that can consistently intercept Tomahawks. “Russia and other countries do not have electronic warfare capabilities efficient enough to reliably misguide the missile or render it inoperable. Its guidance accuracy could be jeopardized. It could also be forced to climb to a higher altitude where it could in theory be intercepted by air defense systems,” he said. The United States most recently used Tomahawks to attack a military base in Syria. The massive airstrike was authorized following an alleged chemical weapons attack in the province of Idlib, which Washington and its allies blame on President Bashar al-Assad although no hard evidence has been provided to support these claims. 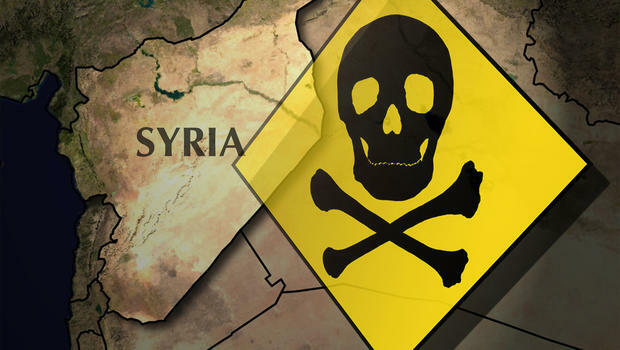 Damascus and the Syrian Arab Army have denied using toxic substances against civilians. Defense analyst Konstantin Sivkov suggested that Damascus needs more than 10 anti-missile and anti-aircraft systems operating at various ranges to protect the Syrian territory. “Damascus needs to create a highly complex air defense system that would help to neutralize a volley of up to 250 missiles, like Tomahawks,” he said. To this end, it will have to acquire several complexes, including the S-300, the Buk, the Tor and Pantsir surface-to-air missile systems. The label of the North Korean state as a Marxist-Leninist regime, even of the particularly repressive Maoist Great Proletarian Cultural Revolution variety, is a misnomer. North Korea is a dynastic autocracy, ruled by a semidivine Kim family with absolute power over both the inner court and the general populace in a way comparable to a Henry Tudor or a Caesar. Even family members who fall into disrepute are not beyond bloody retribution. Just as a Korean king once sentenced his errant crown prince son to die in a rice box of starvation in the sweltering sun, so too Kim Jong-un recently struck down his own half brother with an internationally banned chemical weapon. The fanaticism of the North Korean public, in its devotion to its leader, is not some Broadway-like drama of feigned affectation. A visit to North Korea and discussion with members of the public at large revealed a clear devotion to the Kims. Implied was a willingness to die in defense of the juche philosophy and the great leader and his bloodline. North Korea, for almost four decades a colony of imperial Japan, has seemingly absorbed the kamikaze-like death wish of those pilots who once made a last-ditch suicidal stand to die for the emperor. Stanley McChrystal (retired General and Managing Partner at McChrystal Group) recently posted a LinkedIn article, How I Keep Up with an Unrelenting Work Pace. The article was published February 1, 2016 and is receiving excessive praise from many. It is also receiving criticism from those who note the inherent risks of applying strategic level leadership experiences without thought or reflection. Here are some things you should pay attention to when reading McChrystal’s article. This is a guest post by US Army Captain Thomas Meyer. 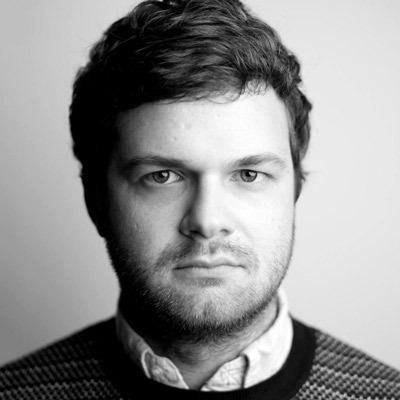 He is the creator of Hay in the Barn Leader, a platform dedicated to improving leaders and their organizations. Follow Hay in the Barn Leader on Facebook and Twitter. First, note this article is not titled, “How YOU Should Keep Up with an Unrelenting Work Pace.” We tend to give excess credence to the words and experiences of those who are successful. Simultaneously, we fail to understand that each individual is different, and these amazingly successful people often have super-human traits, added to their work-ethic, that make them as successful as they are. No matter how hard he/she trains, the average American will never be Lance Armstrong. No matter how much batting practice you take, you will likely never be Hank Aaron. And, no matter how many times I sing “Friends in Low Places” in the shower, I will never be Garth Brooks. Take this article, and all those like it, with a grain of salt – understanding it is ‘A Way’ that worked for one person; not the way. G Murphy Donovan isn’t impressed. 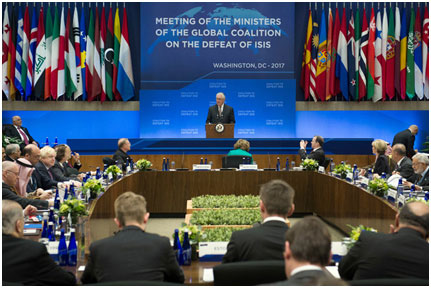 As far as he’s concerned, the fight against Islamic terrorism has two faces today – public relations and “strategic hokum.” Yes, chest-thumping political rhetoric, do-nothing conferences, and faux coalitions continue to substitute for coherent strategy. A truly viable approach, however, needs to accept an uncomfortable truth – the ultimate problem the West faces is a virulent form of religious imperialism. This article was originally published by the Small Wars Journal on 9 April 2017. Targeted Killing: A New Departure for British Defence and Security Policy? The precipitating event is pretty clear: On 21 August 2015, Reyaad Khan – a UK citizen fighting for ISIS – was killed by a Hellfire missile fired from a British drone. The strike, which occurred months before the UK parliament formally OK’d the use of military force in Syria, subsequently led to prolonged debates about the legal basis for targeting one’s own citizens outside of a warzone, parliamentary oversight and government transparency. As Abigail Watson describes here, these debates haven’t been resolved. This article was originally published by the Oxford Research Group’s Remote Control Project on 28 March 2017. On 21st August 2015, Reyaad Khan – a UK citizen fighting for ISIS – was killed by a Hellfire missile fired from a UK drone1 in an operation possibly supported by UK Special Forces.2 This strike occured months before parliamentary approval of the use of military force in Syria, which was not given until December that year, and seemed to mark the first time the UK had undertaken a lethal strike that was outside of a war the UK was militarily involved in. The then-Prime Minister David Cameron announced the strike as a “new departure”3 for British defence and security policy to a surprised Parliament, who were keen to understand both how the strike had occurred when they had voted against UK military engagement in Syria in August 2013 (and once again in September 2014 when they approved the use of force in Iraq but explicitly refused to extend operations to Syria)4, and on what basis the government had approved the use of lethal force against one of its own citizens abroad. The ShadowBrokers, an entity previously confirmed by The Intercept to have leaked authentic malware used by the NSA to attack computers around the world, today released another cache of what appears to be extremely potent (and previously unknown) software capable of breaking into systems running Windows. The software could give nearly anyone with sufficient technical knowledge the ability to wreak havoc on millions of Microsoft users. The leak includes a litany of typically codenamed software “implants” with names like ODDJOB, ZIPPYBEER, and ESTEEMAUDIT, capable of breaking into — and in some cases seizing control of — computers running version of the Windows operating system earlier than the most recent Windows 10. The vulnerable Windows versions ran more than 65 percent of desktop computers surfing the web last month, according to estimates from the tracking firm Net Market Share. The crown jewel of the implant collection appears to be a program named FUZZBUNCH, which essentially automates the deployment of NSA malware, and would allow a member of agency’s Tailored Access Operations group to more easily infect a target from their desk. If you've found yourself squeezing that little bit more life out of your smartphone in recent years, you're not alone. Kantar Worldpanel data shows that compared to 2013, users in the U.S. and Europe are now waiting an average of 2.2 and 3.3 months longer respectively, before upgrading to their next handset. In China, while there has been a net increase of 1.6 months over the same period, the trend isn't yet quite so apparent. This chart shows the average number of months before users upgrade their smartphone in the U.S., China and Europe from 2013 to 2016. PARIS (AP) — A new set of documents purportedly lifted from the U.S. National Security Agency suggests that American spies have burrowed deep into the Middle East’s financial network, apparently compromising the Dubai office of the anti-money laundering and financial services firm EastNets. TheShadowBrokers, which startled the security experts last year by releasing some of the NSA’s hacking tools, has resumed pouring secrets into the public domain, this time by publishing purported details of the NSA’s operations against banks across the Arab world. In a first for TheShadowBrokers, the data includes PowerPoint slides and purported target lists, suggesting that the group has access to a broader range of data than previously known. “This is by far the most brutal dump,” said Comae Technologies founder Matt Suiche, who has closely followed the group’s disclosures and initially helped confirm its connection to the NSA last year. In a blog post , he said it appeared that thousands of employee accounts and machines from the EastNets’ offices had been compromised and that financial institutions in Kuwait, Bahrain and the Palestinian territories had been targeted for espionage. Calls and messages left with EastNets’ offices in Dubai, London and New York were either not picked up or not immediately returned. The authenticity of Friday’s document dump could not immediately be determined but the group’s previous releases have been corroborated by material leaked by former U.S. intelligence contractor Edward Snowden and software patches issued by major U.S. technology firms . The NSA did not immediately return emails seeking comment. Because EastNets provides a host of Arab banks connectivity to the banking system’s electronic backbone, known as SWIFT, compromising the company would give the NSA the ability to silently track financial transactions across the Middle East, Suiche said in a phone call. He said other documents in the release suggested an even wider effort to monitor the world’s transactions. “I’ll bet it’s not the only SWIFT service bureau that’s been compromised,” he said. That list of companies has grown increasingly long. Twitter released two NSLs earlier this year, one from 2015 and one from 2016. Other companies that have released their letters are Yahoo (three), Cloudflare (one), CREDO (two) and Google (eight). Yahoo was the first to release its NSLs.